NEWARK, N.J. -- Not that long ago, a collection of talented young hockey players were trying to find their place in the NHL and ascend to the top of the sport. It was an infusion of phenoms who added excitement and intrigue to the League after a lockout erased the entire 2004-05 season. These fresh faces were a new hope for the hockey community, destined to someday carry the NHL to unforeseen heights. Those teenagers who offered so much promise are now grown men who have delivered on it. Eric Staal won the Stanley Cup first, in 2006. Ryan Getzlaf and Corey Perry were next in 2007. Sidney Crosby and Evgeni Malkin, Jonathan Toews and Patrick Kane, Patrice Bergeron, Dustin Brown and Anze Kopitar all followed with championships before Toews and Kane won again in 2013. Alex Ovechkin has yet to win the Cup, but he does have three League MVPs and is one of the most captivating figures in the sport. Ryan Kesler, Claude Giroux and Zach Parise have come within two wins or fewer of winning a title. All of those players were drafted between 2003 and 2007. All are in their mid-20s or about to be. They were once the future; they are now the present. "You're excited because the expectations now are even higher, and that isn't a bad thing," 26-year-old Crosby, the first pick of the 2005 NHL Draft, told NHL.com Thursday at Prudential Center during the 2013 NHL Player Media Tour. "You kind of crave those expectations to be there every year and compete and win. I don't think there's anything wrong with that. Part of you also feels like, 'Wow, it has been eight years already and it has flown by.' It does go by quick. A lot of us came into the League together. You know those first few years are done and the expectations are higher and we're getting older, but it is exciting to know that now is the time to go out there and find ways to win." More than three dozen of the League's top players are in Newark and Manhattan on Thursday and Friday for interviews and promotional appearances as part of the unofficial start to the 2013-14 NHL season. It promises to be a unique year, complete with a break in the middle for the 2014 Sochi Olympics and the expansion of outdoor hockey at the NHL level. Many of the players mentioned will be featured prominently at these marquee events, having earned a place at the highest level of the sport. They've battled each other along the way, and that's played a part in them reaching this point. "I'm still the kid around my locker room. [Teemu] Selanne won't leave, so everybody is a kid when he's around," 28-year-old Getzlaf, a first-round pick in 2003, said with a hearty laugh. "The ride has been awesome. There's a really great group of guys, and we've been able to compete among ourselves and help make the League better. 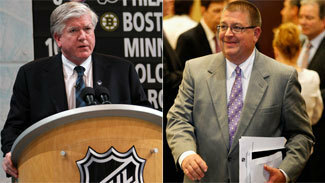 I think it has been a big step forward for the NHL, and for us personally. When you compete with other great players that are about the same age, it pushes you to be better and helps build the brand of hockey." The 2010 Vancouver Olympics proved to be one of the greatest tournaments the sport ever staged, and the gold-medal game one of its greatest contests. Crosby and his Canada teammates became national heroes. Four years later the scene shifts across the Atlantic Ocean to a small city on the Black Sea: Sochi, Russia. That pressure the Canadians felt four years ago will now be on the Russians, who have to atone for a disappointing showing in 2010. "This is my first Olympics at home, so I'm not sure how I'm going to feel," Ovechkin, 27, told NHL.com. "I'm sure I'm going to be excited and it is going to be fun. It is going to be a hard tournament because it is going to be quick. The pressure is going to be on us 100 percent, but I don't know how the big the pressure is going to be." The quality of the hockey in Vancouver in 2010 was incredible, and the possibility for a repeat is there. This will be the Olympics when all of those superstar players mentioned will be in the primes of their careers. "The Olympics are going to be a blast. I hope I can be part of the team again," Getzlaf said. "I think that whole event is going to be great for hockey, and I'm really glad that we're all going to be part of it again." Outdoor hockey has become a staple of the NHL calendar, but the 2013-14 season will usher in a new era. There will be six games played outside during the season, including the 2014 Winter Classic in Ann Arbor, Mich., when more than 100,000 fans will pack Michigan Stadium on Jan. 1 to see the Detroit Red Wings and Toronto Maple Leafs. The growth of hockey in California will earn plenty of attention in the build-up to the Los Angeles Kings and Anaheim Ducks renewing their freeway rivalry at Dodger Stadium on Jan. 25. After the pageantry of falling snow in 2008 at the original Winter Classic in Buffalo, sunshine, palm trees and the San Gabriel mountains will provide a different kind of backdrop in Los Angeles. "It is a great stadium. I think people in California like to get involved with something like this because it is a big event," Getzlaf said. "Both organizations have done such a great job out there of building the hockey community kind of from the ground up. I think our owner has bought nine rinks in the Orange County area and helped build the Young Ducks program that has developed a lot of fans and a lot of kids." The Super Bowl will be outdoors in a cold-weather location, MetLife Stadium in East Rutherford, N.J., and hockey in the New York metropolitan area will be in the spotlight in the week leading up to the Feb. 2 game. The New York Rangers will play the New Jersey Devils (Jan. 26) and the New York Islanders (Jan. 29) at Yankee Stadium. "It was really neat to see the mock rink they put up in the middle of Yankee Stadium and look at all the seats," Islanders forward Matt Moulson said. "It's going to be a great game and a big thrill playing in front of all those fans." There is a new edition of the Heritage Classic in Canada, when on March 2 the Vancouver Canucks will play the Ottawa Senators at refurbished GM Place across the street from where Crosby scored the golden goal four years ago and Bergeron's Boston Bruins won the Stanley Cup the following year. "Last year after we got through that Detroit series, if we didn't believe in ourselves before then, that was really our moment. To come back from a 3-1 deficit against the Red Wings, that is when we knew we could come back from anything." Six days after the gold-medal game in Sochi, the Chicago Blackhawks and Pittsburgh Penguins will meet March 1 at Soldier Field, a marquee matchup to highlight the stretch run to the 2014 Stanley Cup Playoffs. This will be the third outdoor game for the Penguins and the second for the Blackhawks. They are the only franchises to reach the conference finals three times in the past six seasons. "It is a really cool football stadium. It is awesome to watch games in there," Toews, 25, said. "I honestly don't think there are any bad seats in the house. You can be far away from the action and still can see everything and what's going on. They put an ice sheet on it last winter for a college hockey tournament and we got to skate on it. It was kind of cool to see and it should be a great atmosphere. The new building probably doesn't have as much history as Wrigley Field, but I don't think many buildings do. It should still be an awesome atmosphere and a cool game to be a part of." Another big storyline for the 2013-14 is Toews' team. The Blackhawks became the first organization to win the Stanley Cup twice in the salary-cap era when Chicago defeated Boston in June. No team has repeated as Stanley Cup champion since the Red Wings won in 1997 and 1998, and no team has won three times in a five-year span since the end of the Edmonton Oilers' dynasty in 1990. That's an interesting word, dynasty. The NHL used to be a League known for them, but the Blackhawks have a chance to be the first in a long time. "There's a long way to go for that," Toews told NHL.com. "I guess if it could be a 'modern dynasty' or whatever terms people are throwing out there, it starts with last year we had a great team and a great bunch of guys. Last year after we got through that Detroit series, if we didn't believe in ourselves before then, that was really our moment. To come back from a 3-1 deficit against the Red Wings, that is when we knew we could come back from anything. "There's always been something special the past four or five years with our leadership group, that whenever others come in and be part of that group we just become a really tough team to get rid of. We're tough to beat. A lot of things have to go wrong for us to lose in a playoff series. If we can keep leading that same way, find that same belief and will to win, then there is no reason we can't find ourselves back in the Stanley Cup Final and competing for the Stanley Cup again. That's always the goal. I think any time you win the Stanley Cup and then are sitting at home watching someone else wheel off with it, that is a bad feeling. It feels like it is still yours and you don't want to give it up."